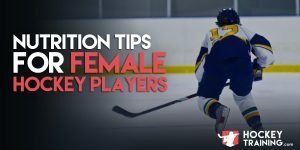 Hockey Hydration Guide - How Much Water Do Hockey Players Need? After oxygen, water is the most important substance in the human body. It is a necessary component for nearly every single chemical reaction, acting as a solvent and transport medium. There’s a big reason why your body is about 70% water, both performance-based and essential health processes require it. Zooming out from the cellular level, water helps to cool down the body and dissipate heat which is crucial towards delaying the onset of exercise-induced fatigue. It also helps to remove waste products from the body that can cause us to be less healthy, but, also cause us to fatigue quicker than we otherwise would during physical activity. As you will find below, even slight dehydration within the body can create negative implications for both health and performance. In almost all cases, by the time you actually feel thirsty you are already dehydrated to some degree. The very signal of thirst is the clear indicator that it is already too late, and your body is demanding action from you in order to fix this problem. This makes pre-planning your hydration strategies crucial as proper hydration pre, during, and post-workout and/or game will provide the greatest training quality and therefore the greatest changes in fat loss, muscle building, and sport performance. These strategies become even more critical when you realize that heavy sweaters performing exercise in the heat can lose up to two quarts of sweat per hour while the small intestine can only maximally absorb 1 quart of water per hour. To utilize these absorption rates to their ultimate potential it’s advantageous for us to consume not only just water, but electrolytes, carbohydrates and amino acids, as well as they all work together in their own way to drive optimal hydration in hockey athletes. A 6% loss in body water: Physical exhaustion, heatstroke, coma. As you can see, the decreases in overall hockey performance begin at such an early stage of dehydration. So, for those of you who know you don’t drink enough water day in and day out, a simple increase in water intake could be next push you need in the gym or on the ice to better yourself. The million-dollar question is, how much water should hockey athletes drink? How much water has a meaningful effect, whether positive or negative, on our performance? Well, if you’re a hockey athlete it should go without saying that you should drink fluids regularly, drink during your training/games, and maintain a clear or off-yellow urine color throughout the day. This will encourage proper function of all your organs and muscles, while keeping your performance levels optimal. How much water do you lose during exercise? If we can answer this, we’ll know how much we need. There are some people who leave a pool of sweat wherever they go when they’re exercising, and then at the same time there are others who only sweat lightly while performing the same given work as the heavy sweater. To add more individual variation, some people are salty sweaters while others are not. You ever see sometimes on gym equipment, or on your hockey equipment, that little white line that surrounds your sweat marks? That’s salt, and that’s what I mean by a salty sweater. Some people just let more sodium go per unit of sweat than others. Salty sweaters who are not focused on their hydration strategies can result in issues such as electrolyte imbalance, impaired absorption from the G.I. tract, and sub-optimal fluid balance. These scenarios all play different roles in the optimal hydration strategy game for hockey. If you want to find out how much you sweat during exercise, a weigh-in pre and post workout can help guide you in the right direction. This is a great strategy for everybody to do, but especially for those heavy sweaters who are reading this. Simply put, if you weigh less after your workout than you did before, you didn’t drink enough. If you weigh more, you drank too much. For proper hydration, whatever loss was made in exercise should be made up with 1.5x in fluid. For example, if you lost 1lb during exercise that would equate to 16 fluid ounces and therefore should be replaced by 24oz (16oz x 1.5 = 24oz). Having said this, you don’t want to become a manic stress ball and weigh yourself every workout. Once you have done it a few times you know your rate of loss and can estimate from there. Hockey athletes should ideally be consuming anywhere from 6-12oz of water every 15-20 mins during exercise. Additionally, electrolytes and carbohydrates should be added to this mixture as well, as they act like a sponge and draw water into the muscle cells of the body (our favorite carb powder is ATP PentaCarb). This drives a more complete hydration at a faster rate, while simultaneously decreasing the pH levels of the muscle (electrolytes) which aids in delaying the onset of exercise-induced fatigue and also provides the body with a readily available energy source to train hard (the carbohydrates). This liquid mix should come in the form of a 6-8% solution. Meaning, the powder should comprise of only 6-8% of the total drink you’re going to have either during a game, or during your workouts. Going higher than this it has shown in research that it is going to delay gastric clearance, which means it is going to sit in your gut longer and take longer to get to your muscles. These nutrients need an appropriate amount of water in order to get optimally and quickly transferred out of your gut. This otherwise delayed gastric clearance is almost certain to cause some unwanted G.I. distress and that “waterlogged” feeling. You know what I’m talking about here. So, if your drink has 40g of total powder in it, your water content should be a minimum 500ml. If you’re just trying this for the first time, I highly recommend sticking to a 6% solution to start as that will be the easiest on your G.I. tract. After you find out what’s comfortable for you and what’s not, adjust accordingly based on your preference. Post-game, you don’t have to worry about the percentages anymore. It can be over 10% because absorption will occur anyhow and performance is no longer the #1 priority, getting home and avoiding going out for wings is. Another option for improved hydration and performance during exercise is the addition of amino acids (or) whey protein isolate into this solution as well. Protein/amino acids prevent muscle tissue breakdown (loss of muscle), and also to provide energy substrates if need be. Beyond this, adding a source of protein or amino acids can actually enhance hydration, most people don’t know that certain amino acids found in protein also contribute to enhanced absorption of water and sodium through the small intestine for even further enhanced muscular hydration (Aspartate, Glutamine, Alanine, Cysteine, Serine, and Glycine to be precise). The more effective we can create a hydration passage through that small intestine and the more digestive pathways we can utilize to maximize hydration, the better. Keep in mind though, if you are going to add in amino acids to your drink it still should be a 6-8% solution. Lastly, if you’re a salty sweater, having a couple pieces of beef jerky alongside your post-workout shake or post-game meal would be a good idea to restore some sodium balance. This is a very easy, simple trick as beef jerky takes forever to go bad and can easily transport with you anywhere you go. Although I should add, there is a very large misconception out there that sodium is bad for you, it’s not. So long as you drink enough water, you are A-OK to take in high amounts of salt. #3) There are many water intake guides out there; my personal favorite is Bodyweight / 2 = daily intake in ounces. For example: 200lbs / 2 = 100oz daily water intake. This is just a guideline and is also just a starting point, you must adjust accordingly from here as body weight suggestions can be lofty sometimes given that muscle is 75% water whereas fat is only 10% water. Different hydration needs for different active tissues depend on your current body composition (overweight people have less hydration requirements due to lower levels of muscle tissue). Additionally, this recommendation does not account for the during exercise recommendations as people sweat at different rates. It’s a great starting point, so use it as such. I hope this article was able to point out some seriously important factors as to why you should be taking more action towards your personal hydration status. Your action plan today is to calculate how much water you need daily, figure out how you’re going to hit that goal everyday, and start putting together the pieces you need for your intra-game and intra-workout shake to maximize your hydration. Let’s go! 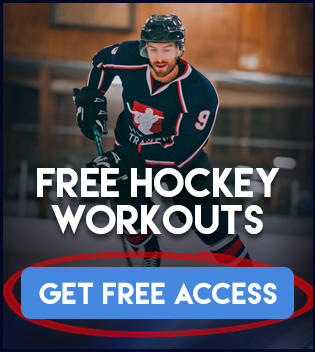 Our recommended Carbohydrate powder for hockey players is ATP PentaCarb by ATP Labs and you can purchase that online here. 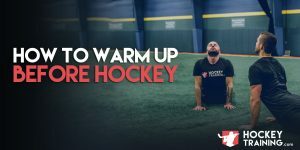 If you want a training program to help you dominate on the ice this year, check out our Hockey Training Programs page to find the best program for you!